Did you know that the average person requires 7 to 8 hours of sleep a day, according to the Better Sleep Council? This means that we spend 1/3 of our day sleeping! If I'm going to be spending that much time sleeping, I'm of the opinion that I might as well spoil myself and make my bed as comfortable as possible. While I think our mattress does a decent job, I knew our bedding needed some help. The problem is, it's not easy for us to just go out and BUY a comforter and sheets. You see, my husband is sensitive to polyester. This means that cotton is usually our only option. This may not seem like an issue at first glance, at least until you see the cost of quality cotton sheets. Usually, a set of soft 100% cotton sheets that is at least 600 thread count costs around $150+ for a king bed, especially with the fact many sets make you buy the pillow cases separately. Wowzers! I knew I had to find something that felt as amazing as cotton but didn't bother my husband's allergies. 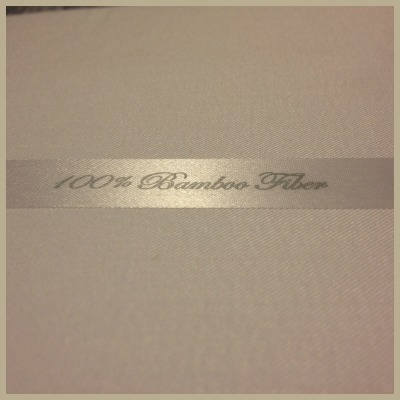 Just when I was about to give up, I found the perfect, eco-friendly solution – bamboo sheets from Fiber Element. To say the least, I was ecstatic when I found out I could review a king size set for free! Bamboo Fiber? How's that work? Over the past decade, bamboo has quickly been becoming popular in North American, especially in the form of towels, dishware, bedding, and just about anything you can imagine. Part of what makes bamboo such a great ecological choice over typical cotton is the fact that it's fast growing, durable, and does not require the use of dangerous chemicals or fancy irrigation systems to grow. For people who are eco-friendly, bamboo is the most sustainable option if you are wanting to reduce your carbon footprint. But anyone who has seen bamboo knows that 'soft' isn't the first thing that comes to mind for this stiff, pole-like plant, right? When Fiber Elements makes their bamboo sheets, they use 100% bamboo viscose, which makes amazingly soft sheets – even softer than 1,000 count cotton sheets, in my own experience. Best of all, their elegant, bamboo sheets are luxurious but reasonably priced, allowing just about anyone the chance to feel like royalty when they relax at night. When my set of Fiber Element Bamboo Sheets arrived, I couldn't wait to get started with my review. My favorite set of 1,000 count cotton sheets had caught and ripped earlier that day after an unfortunate encounter with Reya, so I was desperately needing another set of sheets. Having been spoiled with high quality cotton sheets, I had no clue what to expect from bamboo sheets. From the moment I took these sheets out of the package, however, I was amazed. These sheets were just so soft! When I say soft, I mean comparable to – if not better than – satin or silk. This was definitely a pleasant surprise! The big surprise, however, came when it was time for bed. You know your sheets are going to be good when you hear your husband say, "Wow! These sheets feel amazing!" After hearing that, I couldn't wait to lay down and try the Fiber Element bamboo sheets for myself. Saying these sheets feel amazing almost doesn't seem like enough praise! These extremely soft sheets feel cool to the touch when you first lay down, and then slowly start warming up. For someone who is sensitive to heat (okay, I would rather live in an ice cooler), I thought these sheets were truly amazing! While I loved these sheets, I was very worried about washing them. The last time I bought soft sheets that claimed they would stay soft, they started piling badly after being washed and the fabric lost its softness. Since I love the feel of my Fiber Element bamboo sheets, I really didn't want to wash them. I knew that after a week of use, however, it needed to happen. After putting them in my HE front loading washer, I followed the wash instructions, wanting to make sure I did everything that was necessary to keep these sheets feeling great. It actually surprised me that the care was so easy. All I had to do was wash them in cold water with a mild detergent. Since I only use eco-friendly, mild detergents, this was just like washing all of my other clothes! What surprised me, however, is that they didn't recommend using any form of fabric softener, as well as never using bleach. After crossing my fingers, I started the wash. Following their instruction, I had no piling issues and the fabric still felt as good as new. Drying my sheets was just as easy. The recommendation is that you fold them loosely (to avoid wrinkles) and put the sheets on the lowest heat possible and on a gentle cycle. My only mess up was that I forgot to take out my bounce bar. Luckily, this didn't ruin the sheets at all and they still had a wonderfully soft feel. Now, imagine silky sheets hot right out of the driver! 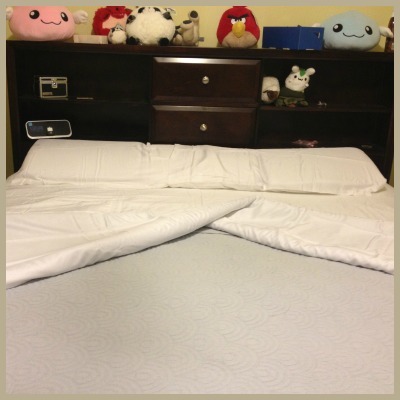 To say the least, my Fiber Element bamboo sheets felt like heaven and didn't take any special care. Having spent quite a bit of time in hotels while traveling with my husband, I have slept on some very nice sheets. These sheets, however, may very well be the best sheets I have slept on in my life. They make going to bed a truly enjoyable, luxurious experience. As well, nothing is better than snuggling into pleasantly cool sheets that warm up as you lay there, helping you get more comfortable as you prepare to go to sleep. In a way, Fiber Element perfected the entire sleeping experience with these sheets. I've had some very nice sheets before, but nothing can beat these sheets. 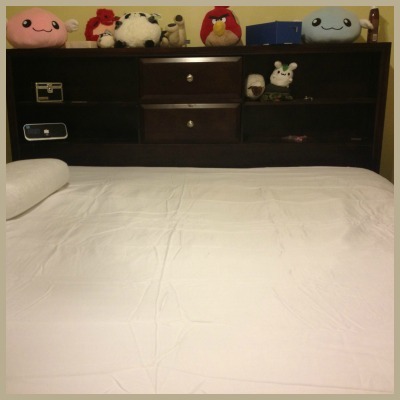 Based on my own experience with Fiber Element's bamboo sheets, I can happily award these sheets an A+ rating and highly recommend these sheets for your own master bedroom! Trust me – they are worth it! Want to try these awesome bamboo sheets for yourself? These sheets are currently available in four common mattress sizes – Full, Queen, King, and California King, ranging from $89.99 – $159.99 a set with free shipping. Best of all, unlike most higher end sheet brands, they even include the pillow cases in the set, an amazing, complete set for a reasonable price! To purchase a set of these sheets or learn more, make sure to head over to the Fiber Element Website. Also, don't forget to like them on Facebook & Twitter to see their latest sales! Disclosure: Budget Earth did not receive compensation for this review but did receive free products from Fiber Element for review purposes. All opinions on this product are my own and may differ from our readers' opinions. Would you like to have your products or event featured on Budget Earth? Want to increase your social media exposure before the holiday season? See how Mom Powered Media can help! Contact budgetearth@gmail.com to see what we can do for your company! I have not tried bamboo sheets but have heard of them. After reading your review I will be checking into getting them. I llike the fact that they are easy to care for and that they come as a complete set. They sound great. Can we hope for a giveaway soon? I love having soft sheets. But like you, I'm always afraid of the sheets being not so soft after I wash them, which always seems to be the case. I'd love to give these a shot! My primary concern when buying bamboo products is where they were grown; sometimes, they deforest non-indegenous areas to plant bamboo which is fast growing. Thanks for all the information. These were grown in China, Tianjin province. If I were to estimate, I would say that 99% of all commercial bamboo used for textiles is grown in China. So they are all recurring crops set aside for bamboo harvesting, as opposed to knocking down a forest to grow bamboo. Some people are growing bamboo in Central America now (for timber and hardwood flooring etc.). They are using defunct farmland, which is really cool! These bamboo sheets sound great, but I wonder why they don't offer smaller sizes. My husband and I have twin extra long mattresses, which are also common in college dorms. And do kids and singles with twin mattresses not deserve to be comfortable? I've noticed the same prejudice from other companies that offer "luxurious" high thread count bedsheets. The only thing I can figure is that the cost of queen or king sheets is usually more than double the cost of two twin sheet sets, so the manufacturers can make a lot more money off the same (or even less) material. Anyway, if you have a chance to tell the company that some people are asking for Twin XL, maybe they'll consider adding that size. Auriette, I was thinking the same thing too. Children should have comfy sheets as well! I will contact the retailer and let what they say! These would be great and so soft and comfy. wish i could own some, but they are way out of my price range economically. thanks for sharing. I have been hearing so much about bamboo sheets and towels. Everyone says they are very nice and soft. Next time I need to buy bedding I am going to try them. I need new sheets very badly on my queen size bed. I always have a problem finding ones because I have a very thick pillow top mattress and every fitted sheet always rips because of it being so thick!! And before I buy, I always look at the dimensions and they still end up ripping!! Will these be the same way???? I have a super thick mattress on my bed too, Nicole. Ours is a huge pillow top king bed with memory foam. It fits with room to spare, which is very odd! WHen they say extra deep, it’s extra deep! Love the sheets. I am way past due in replacing mine. Looks really nice. I will have to look into these. Need new sheets. 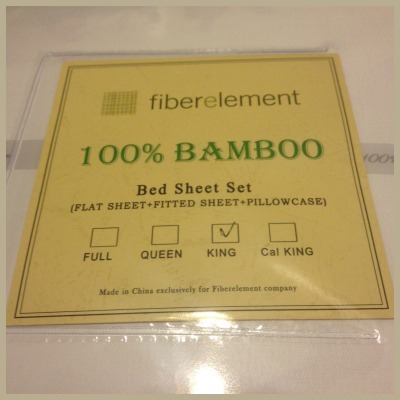 I would love to own a pair of King size Fiber Element bamboo sheets. I like your review and feel that with Christmas coming up in a few months, these may just show up on my gift list I give to my husband. These sound great, but still pretty expensive. Thanks for the review! I would like to know about the chemicals or additives used in converting the bamboo plant into fiber.